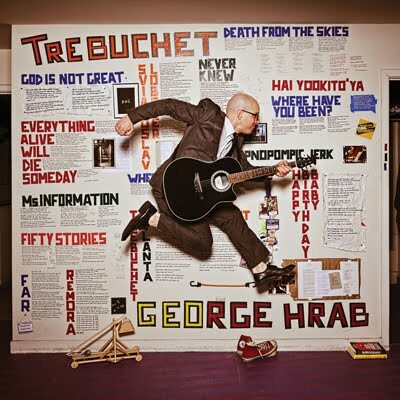 While George Hrab’s new album, Trebuchet, is expected to break interstellar sales records, The Babbler’s Dale Onofrey offers his earthly review. George Hrab starts off Trebuchet by humbly stating that God is not great, then Hrab clings to the listener as demons drag him to hell. Hrab offer a mix of King Crimson licks, King Missile snark, jazzy riffs blended with Blues Explosion attitude minus the need to constantly say his name, with liberal dashes of punkish James Randi viscousness. All of this in a vain attempt to cover up the fact that he is soulless, both artistically, and literally! Oh, by the way, progressive rock is a fancy of saying noodling! The album almost reaches a nihilist climax when he states that, “Everything alive will die someday.” Speak for yourself, Hrab. By following the teachings of Dr. Chopra, I intend to reset my biological clock, and never receive the wages of sin! Heck, Chopra and I will outlive God together! If Hrab is writing the soundtrack of skepticism, then I’m going to skip the movie. Give me The Secret and Oprah. They show us how universe is here to serve us. It is not, as Hrab says, an uncaring place that has lousy odds of destroying the Earth. Hrab is a musician, blogger and podcaster to avoid! Download this album directly into a trench bucket! Oh, I don’t care what Reporter X thinks, aliens have poor tastes in music! Dale Onofrey write the "Web Sites to Avoid" column for The Babbler.